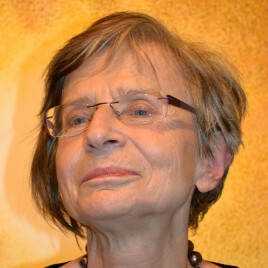 (born in 1948) – translator, essayist, German Studies expert. She translated about 80 books, including works by Hans Georg Gadamer, Jürgen Habermas, Theodor W. Adorno, Friedrich Nietzsche, Hermann Hesse, Robert Walser, Patrick Süskind, and W.G. Sebald. Author of collections of essays, including Robert Walser (1990), Rubryka pod różą (2007, nominated for the Nike Literary Award), Jak być artystą. Na przykładzie Thomasa Manna (2011, nominated for the Nike Literary Award), Dziwna rzecz – pisanie (2012). In 2017, she published a volume on the art of translation entitled Pięć razy o przekładzie. Laureate of the Literatura na Świecie Prize, the Polish PEN-Club Award, the Zeszyty Literackie Prize, the Hermann-Hesse-Preis and the Polish-German Prize.